2/35: First Floor Covered Carport/Patio Area with Custom Benches. 16/35: View of Beautiful Spacious Walk In Shower with Bench. 32/35: Community pool is a very short distance from the home. 6 Seater Golf Cart included with $500 refundable security deposit. ** Additional rules apply. Beautifully furnished with Lots of comfortable seating in Living room, One King Master suite on first floor, Two complete King Master Suites on the second floor, and a Bonus King master on the second floor with en-suite bath, and Bunk room with 4 beds. Elegant Coastal feel throughout this fine home. Emerald Waters Villages offers two lushly landscaped community swimming pools. 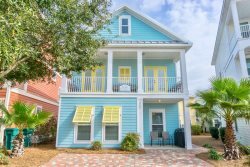 This Fabulous private community is located on the East side of Holiday Road in Miramar Beach near the corner of Scenic Gulf Drive and Frangista Beach. This secluded neighborhood is close to tons of shopping, dining, golfing, and entertainment. Destin Commons is a favorite Shopping area in Destin as well as Silver Sands the nation’s largest Designer Outlet in America. Anchor stores in Destin Commons include Bass Pro Shop, H&M Store, Belk and Uncle Bucks upscale Bowing alley. Silvers Sands boasts designer stores such as Michael Kors, Tommy Hilfiger, Polo Ralph Lauren, Calvin Klien, and Coach. Close by you will also find Whole Foods, Winn Dixie and Publix Grocery. Tons of nearby activities and places to enjoy. Side by Side refrigerator with ice in door and additional under counter Ice Maker! Master bath has double vanity, Large walk in shower and Large closet with a FULL size BABY CRIB! King guest room with 55" 4K LED TV with Access to the Covered Porch. En Suite Bath has Tiled Tub/Shower combination and double Vanity. Additional Full size stack Washer and Dryer on Second floor. Nothing is lacking in this New Upscale home including everything you need for cooking fantastic meals. Open floor plan encourages gathering together as family and friends. Lots of new Leather seating in Living area with 65" 4K LED TV. Emerald Waters Village is close to numerous shopping areas, restaurants and entertainment. The Famous Destin Commons is a must see with Rave Movies, Bass Pro Shop, tons of small shops, restaurants and Uncle Bucks with Bowling. Nearby you will find quite a few mini mall areas with groceries, pharmacies and gas stations. Be sure to visit Harbor Walk Village, where there are fun activities galore for all ages - Zip Line, rent a boat, charter fishing, great restaurants, night life and live music almost nightly. Margaritaville is a must!!!!! Don't Forget Lu Lu's on the Bay! Awesome food and lots of fun for the kids. Several Golf Courses are within a five mile range and you will find a few tennis clubs too! Don't miss The Village of Baytown Wharf you can Zip line, play on the huge playground, walk along the pier, feed the fish, enjoy great eateries and fun nightlife!